This is the first in a series of blog posts aimed at the enterprise SQL Server DBA. I’ll demonstrate how to administer your SQL Server workloads on Amazon EC2 using practical examples and best practices. In this post I’ll show you how to use Run Command from Amazon EC2 Systems Manager to update one or many of your SQL Servers to the latest service pack. Microsoft SQL Server is a popular workload on Amazon EC2. Keeping your SQL Server instances up to date with the latest service pack is important for the stability and security of your critical data. If you need to support multiple versions and editions of SQL Server keeping track of all the latest service packs can be cumbersome. Run Command provides a simple and secure way to remotely execute commands or run scripts against EC2 instances or on-premises servers. With Run Command, you can perform commands that make it easy to accomplish common administrative tasks like upgrading SQL service packs! When you use EC2 Systems Manager you’ll need to first work through some prerequisites. The most important prerequisite is that you’ll need the SSM agent installed on your instances. The SSM agent is installed by default on Windows Server 2016 instances and instances created from Windows Server 2003-2012 R2 Amazon Machine Images (AMIs) published in November 2016 or later. Another pre-requisite is that your instances need to be assigned an AWS Identity and Access Management (IAM) role. The IAM role is used to secure the permission policies needed to communicate with the Systems Manager API. Instances are usually added to an IAM role on launch, but you can also add existing instances using the AWS CLI. For this exercise we’ll use the Run Command native support for PowerShell modules to download and import a PowerShell module from an Amazon S3 bucket. This module will be called to identify the version of SQL that is running and then download and install the latest service pack. I’ll walk you through updating the SQL service pack by using the AWS Management Console and by using AWS Tools for PowerShell. Sign In to the AWS Management Console. To confirm that your instances are in a state to be managed, make sure they are listed in the EC2 console under EC2 Dashboard\Managed Instances. 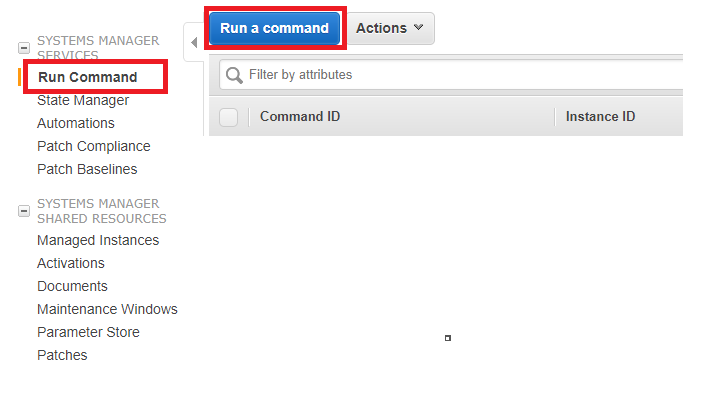 Navigate to the Run Command and choose Run a command. Then select the AWS-InstallPowershellModule document, and the servers you’d like to upgrade. Choose the Run button and check the Status column for the instance progress. Choose a specific Instance ID in the top pane, and then in the bottom pane choose the Output tab and then choose View Output. The results of the service pack upgrade are shown in the Output results window. For those who prefer a scripted solution you can call Run Command using the AWS Tools for Windows PowerShell. Download and install the latest AWS Tools for Windows PowerShell. Start-Process -FilePath msiexec.exe -Argument List "/i $AWSPSSetup"
2017-08-18 23:54:41.410 - Destination folder C:\Windows\temp was successfully created. Amazon EC2 Systems Manager offers a suite of tools to help you manage both your EC2 and on-premises SQL Server instances. 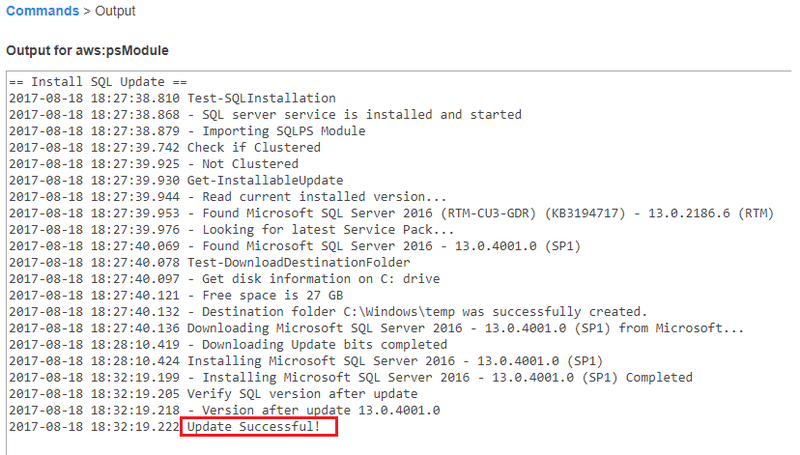 In this post, I showed you how to use the Run Command feature of Systems Manager to easily upgrade SQL Server to the latest service pack. In a critical production environment, when you upgrade you might have extra steps to perform before and after, such as database backups, failovers, failbacks, etc. So, in the next post I’ll show you how to use the Automation feature of Systems Manager to achieve custom maintenance workflows. 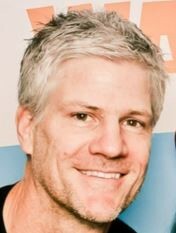 Alan Cranfield is a Senior Systems Engineer on the EC2 Windows team where he uses his extensive experience managing critical enterprise environments to help make AWS the best cloud platform for running Windows workloads. He spends his spare time in the garage restoring and customizing old motorcycles.